Sure, we know what you’re thinking. Resume paper? Who the heck uses paper resumes anymore in this day and age? To be clear, we at Resume Genius recognize that paper resumes are no longer as dominant as they were when our parents were on the job hunt. However, don’t be too quick to assume that you’ll never need a physical version of your resume again. 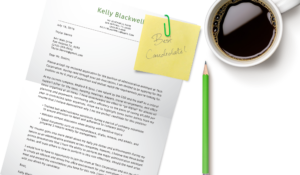 Even in the age of online applications and applicant tracking systems, there are still a couple reasons when a physical resume might come in handy. For example, it’s always seen as a professional courtesy to bring in copies of your resume for an interview. It shows that you value preparation and organization. Also, while they may be a dying breed, there are still those ultra aggressive job seekers who show up to an office in person – with resume in hand – to request to discuss any job openings with HR. To begin, we must admit that we are not fans of ivory paper. Although you can’t tell from the image above, the ivory resume is more of a cigarette-stained yellow than an off-white ivory. If you are going spend money on professional resume paper, either go BIG OR GO HOME. Besides the color, this paper also lacks weight. If you are going spend money on professional resume paper, either go BIG OR GO HOME. Sure, the 24lbs paper feels a bit thicker and more durable than the run of the mill printer paper, but it comes no where close to the feeling you get when you pick a piece of heavy-duty 32lbs paper. As you can tell from the image above, ivory paper can be deceiving. When placed in natural light, the color tends to be lighter and whiter. However, when sitting in a poorly-lit area, the ivory looks like a 20-year old newspaper that’s been sitting out in the sun. The only difference between resume #1 and resume #2 is the percentage of cotton. A higher percentage of cotton helps toughens the paper by making it harder to tear or crease. Additionally, paper with a higher percentage of cotton lasts longer. In fact, you can expect one year of usability for every 1% of cotton. In case you are curious, the resumes featured in this comparison are our ‘Career Level & Life Situation Templates.’ If you like how they look, you can download them here. The linen resume was by far the best of the seven that we compared. The standout quality of the linen paper is its unique texture. Hiring managers find the linen resume irresistible as the interwoven weaves make it impossible not to touch. Keep in mind that when printing your resume that most textured paper usually only apply the features to one side. But that’s not all! The linen paper is also 100% cotton and 32lbs, making it the most durable and powerful resume of the bunch. When you pick up this resume it’s almost as if you can feel the weight of the candidate’s experience. Overall, using this paper is sure to leave an impression on any employer and demonstrate that you are a sophisticated and professional applicant. If you want to get the attention of an employer, using some boring old white paper isn’t the best way to do it. However, white paper is often a safe choice for job applicants who aren’t sure how a hiring manager will react. If you believe that the company you are applying to leans on the conservative side, then avoid using a pink resume (a la Legally Blonde) and stick with the traditional white. This resume would have received four stars were it not for the fact that it’s only 24lbs. Again, if you’re going to go the extra mile and purchase resume stationary, buy the heavier and thicker version. So, now that you’ve seen a white and ivory paper side by side, what do you think? After surveying our entire office, we couldn’t find one person who liked the ivory versions. If you would use ivory, please tell us why in the comment box below. We’re interested to hear what you think. Resume #6 is a solid choice. It’s 100% cotton, crisp, has a high impact factor, and sits at a premium weight. The only thing this paper lacks is a little flavor and some color that might help it to further standout. Interestingly enough, some paper companies watermark their products. This is used as a security feature to help prevent fraud. To complete the comparison, we included Southworth’s CV paper since many countries outside of the U.S. use the CV format. The only real difference between the CV and Resume #4 is the size of the paper. Resume #4 is 8 1/2 in. X 11 in.while the CV paper is A4. We hope our comparison has made it easier to decide which kind of paper can optimize your resume. Which of the seven resumes do you prefer? Let us know below. Kelly has misspelled “professional” at the top of her black resume, however. I’ll be preparing my work on 32lb cotton paper going forward. Good catch! It’s good that you’re taking the time to make sure that your resumes are typo-free. We’re also happy that you were able to learn what was the most suitable resume paper for you. Best of luck with the job hunt!